RenovationMates provides reliable renovation services for your house, flat, commercial and domestic property in London. Our technicians are ready to help you seven days a week. When they need to upgrade their home, most homeowners in London use our professional renovation services. We have vast experience in this field and our teams of builders are very sophisticated and trained. What sets our service apart from that of other companies in the city is its cost effectiveness, high-quality and efficiency. We put customers first and we’re confident we can fulfil their requests, no matter what they are. Our company is available for several districts of London, including London. If you want to learn more about our service, you should get in touch with us. We have a service centre, so if there’s anything you need to know, feel free to call us 24/7. Also, see a full list of the services we offer below. Here in London, we provide a full range of first-class renovation services, which are customisable and will definitely suit your individual needs. We do everything from insulation to roofing. Our builders and fitters are very well trained and hard-working. They have a vast amount of knowledge on building, decorating and installing, and they’re completely professional. Home insulation: it is intended to make a property more energy efficient. It ensures better heat and moisture control and thermal comfort. 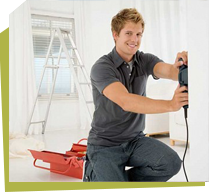 Decorating services: includes painting and re-painting walls and other surfaces in the house. Plasterwork: ornamentation done on ceilings and both exterior and interior walls. The main material used in the process is plaster. Kitchen fitting: installing a new kitchen. It includes fitting of kitchen cabinets, countertops, appliances, sinks, faucets and other units. Bathroom fitting: installing a bathroom, including fitting of faucets, sinks, mirrors, toilets, shower cabins, showers, tubs and anything you can think of. Floor fitting: laying different types of flooring. Loft conversion: re-constructing the attic so that there is more space in the house. There are several types of loft conversion. Reroofing: replacing a property’s roofing system. All of these services can help you refresh your home one way or another. Just pick the service you want and let us know you need our help. We will schedule a date pretty quickly. Get in touch with us to make an appointment. We’re waiting for you.